Monday April 23rd 1900 The boys finished putting in the oats down on Eds ground I worked out of doors all day when not busy with the meals. I set 6 hens on turkey eggs. Tuesday April 24th 1900 It looked like rain in the morning but did not rain enough to hinder the work. Will and Leonard planted potatoes and Luther sowed grass seed. I was busy with the kitchen work all forenoon. Luther churned twice for me in the morning. I did a little sewing in the afternoon. Wednesday April 25th 1900 I was very busy with the house work all forenoon I had early dinner and went to town in the afternoon taking Ossie Spencer with me. Did the wash after coming home. This was Bro Charlies birth-day. 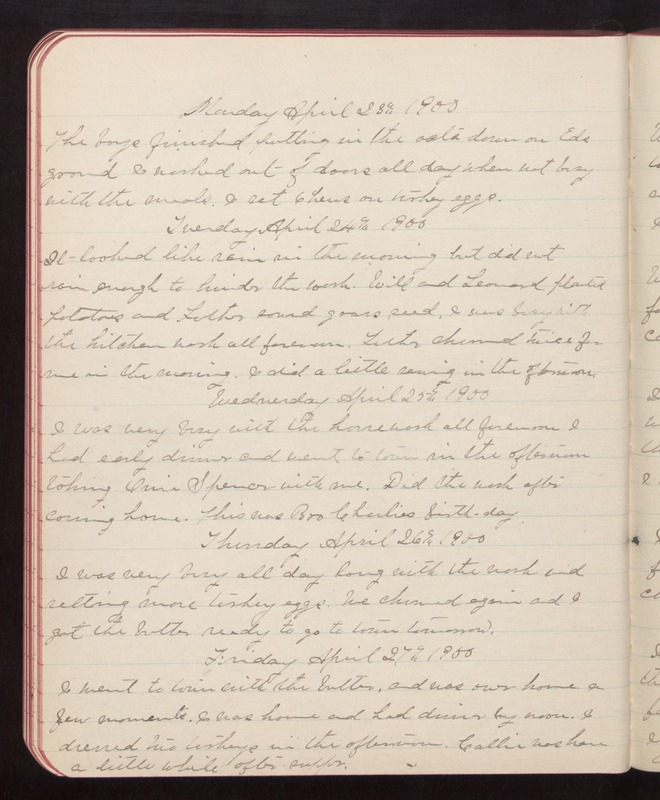 Thursday April 26th 1900 I was very busy all day long with the work and setting more turkey eggs. We churned again and I got the butter ready to go to town tomorrow. Friday April 27th 1900 I went to town with the butter, and was over home a few moments. I was home and had dinner by noon. I dressed two turkeys in the afternoon. Callie was here a little while after supper.